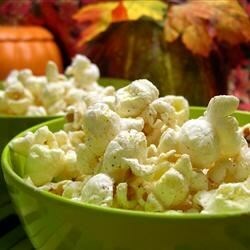 "You will never go back microwave popcorn after trying this range-top recipe. It is made with oil, margarine, and seasoned salt." Start by cutting a paper grocery sack in half. This will serve as a makeshift serving bowl and it will absorb excess oil. In a 2 quart pot, combine the oil, margarine and popcorn. Set over high heat, and constantly shake the pan back and forth. After the first kernel of corn pops, place the lid on the pot, and continue shaking. When the popcorn starts to lift the lid up off the pan, remove it from the heat, and hold it over the paper bag until it stops popping. Pour into the paper sack and season with half of the seasoned salt. Shake the paper sack to distribute the salt. Taste before adding more so you don't make it too salty. You can always add more salt. lmao, us indians have been doing this for years. I thought it was something new, but it's not, lol. Try adding the salt in with the oil, margarine and popcorn before popping. This is how we do it and it's popcorn is the best!!! Delicious! Used butter in place of margarine. My mom and dad couldn't stop eating it and kept saying "This is the best!!!" Great recipe-I have made this recipe for years, since I was a kid. The only addition I have made is shaking parmesan cheese on it as well (use less salt) - delicious!